CLEARWATER, FL--(Marketwire - March 9, 2011) - The Moorings is pleased to introduce the newest yacht in their bareboat sailing charter fleet -- the 3-cabin/2-head Moorings 3900. This new catamaran joins the fleet as part of a recent $65 million investment towards the purchase of more than 140 new yachts for the 2010-2011 charter season, including 7 current models and the recently introduced Moorings 50.5 monohull. Representing the highest standards in semi-custom charter yachts, all yachts are built exclusively for The Moorings through partnerships with two of the world's leading builders, Robertson & Caine and Beneteau. The new yachts are being delivered to 12 of The Moorings charter destinations, including the British Virgin Islands, Bahamas, St. Lucia, St. Martin, Grenada, Belize, Mexico, Greece, Croatia, Turkey, Tahiti and Thailand. Cheryl Powell, COO of The Moorings, remarked, "By working solely with these industry partners, we can ensure that our guests receive the most innovative, comfortable and safe yachts available for charter vacations. All of the catamarans and a majority of the monohulls are delivered to their assigned cruising grounds on their own bottoms. This is an industry first and true testament to the excellent handling, comfort and safety that's inherent to each yacht's design." A luxurious new catamaran model designed by multihull architects Morelli & Melvin and built in the Robertson & Caine factory, the Moorings 3900 was based upon the award-winning hull design, interior accommodation plan and helm station of their private model Leopard 38, named Cruising World's Boat of the Year 2010 and Best Boat 2010 by SAIL. With a generous sail plan and hull design, the 3900 offers high performance yet is highly practical and easy-to-use. 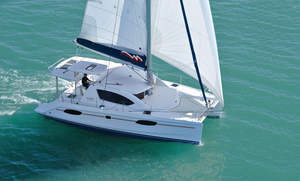 The Moorings 3900 features a raised helm station, which offers 360-degree visibility beneath a hardtop bimini, while a separate extended hardtop with hatch ventilation shades the spacious cockpit. Solar panels installed on the cockpit hardtop charge the onboard batteries. She is equipped with a full suite of Raymarine navigational electronics, cockpit-led sail controls, anchoring system with electric windlass, convenient dinghy davit with electric winch, and generator. Inside, comfort remains a priority with a galley-up design and air-conditioning throughout the saloon and roomy 3-cabin/2-head accommodation plan. Fully equipped, the ergonomic galley layout features heat-resistant Corian countertops, standard stainless steel stove with oven and broiler, deep sink with mixer tap, large refrigerator-freezer system and ample counter and cabinet space. Powell continued, "The Moorings 3900 is a uniquely designed yacht and welcome addition to our fleet with luxurious amenities." The entire starboard hull is dedicated to a private, well-appointed charter suite with queen-size berth, study area, hanging storage, en-suite bath with electric head and enclosed shower compartment. Two large double cabins with a shared bath fill the port hull, and the saloon converts into a single berth." There's generous headroom throughout and substantial storage capacity provided by under-bunk lockers. The Moorings 3900 will first be available at The Moorings charter bases in Greece beginning June 2011; then the British Virgin Islands, Bahamas, St. Lucia, and Mexico in late 2011. The Moorings newest monohull, the Moorings 50.5 is now available for charter vacations at The Moorings bases in the British Virgin Islands, St. Lucia, St. Martin and Grenada. Additionally, the 50.5 will be available June 2011 at The Moorings Greek bases in Athens, Kos and Lefkas. This Beneteau-built yacht is equipped with the latest marine technology, including a full suite of Raymarine electronics, bow thruster, electric winches, dual helm, aft-lead sail controls, furling genoa, full bimini with dodger and a wholly-integrated mainsail arch with traveler. Her interior amenities ensure comfort for all aboard in four staterooms with en-suite electric heads, a forepeak cabin with head, air-conditioning, generator, flat screen TV/DVD player and fully outfitted galley. For information about The Moorings charter vacations and fleet, visit www.moorings.com or call 1-800-535-7289. The Moorings 3900 and Moorings 50.5 yachts may be purchased through The Moorings Yacht Ownership Program. Owners enjoy up to 12 weeks of use each year, access to yachts in over 30 destinations worldwide, guaranteed monthly revenue to cover their boat loan, no operating or insurance expenses, and professional maintenance at no cost. For additional details, visit www.mooringsyachtownership.com. Editors Note: As the world's premier yacht charter company, The Moorings has delivered unmatched quality, service and attention to detail since 1969. Sail-it-yourself bareboat yachts, all-inclusive crewed yachts with captain and chef, and power yacht charters are available. The Moorings is owned by TUI Travel, PLC, one of the largest and most successful travel and tourism companies in the world. Trust in TUI: Your vacation is in safe hands. For Yacht Sales media inquiries contact slong@tuimarine.com. The Moorings is pleased to introduce the newest yacht in their bareboat sailing charter fleet -- the 3-cabin/2-head Moorings 3900.